James is 74 years young and started gardening just three years ago. He lives in Georgia, and began using the square foot gardening method. James recently started gardening in containers. I built two 4′ x 4′ raised tables that are on my open porch and one 5′ x 36′ raised bed. I got more vegetables than my wife and I can eat, so I give the vegetables to my neighbors. I have about fifty 3-gallon plastic containers and about fifteen 5 &6 gallon containers. 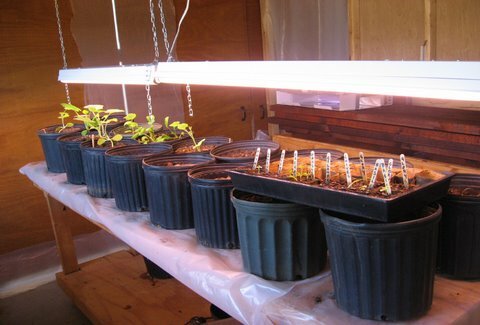 The advantages to using containers for gardening is that you can move the containers indoors in the winter and by using a grow light you can grow vegetables all year long. If the normal growing season is 9 months and you extended that by 3 months by growing plants indoor and by rotating the plant and by canning and drying of your vegetables. You could harvest vegetables continuously. One hundred containers would require a minimum area 4’ x 24’= 96 square feet. 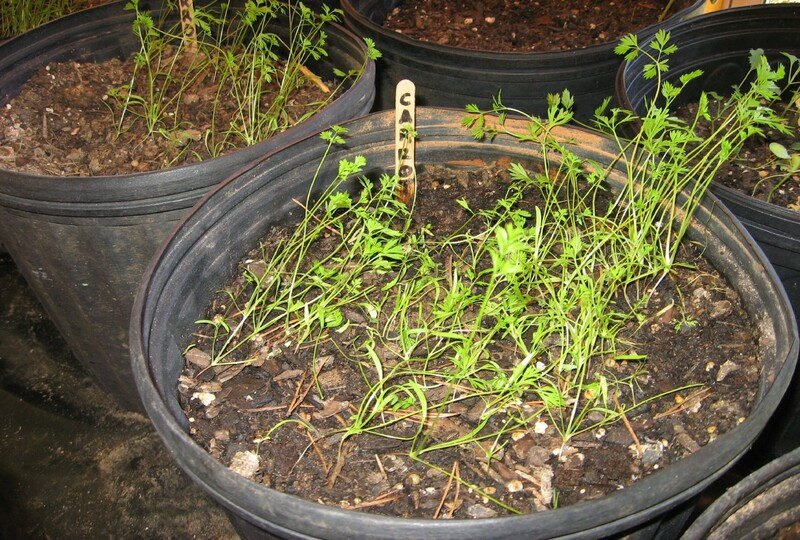 You could spread out the containers by placed them around on a patio or deck or on the ground. If these containers are placed in a room or basement on tables with an aluminum reflective sheet behind the vegetables with a grow light in front of the vegetables you can grow vegetables when the weather is freezing outside. The plants will do well so long as the inside temperature is above 60 degrees. A decorative container with a colorful cabbage or cauliflower makes for a lovely home interior landscaping on your patio, or deck. What I did was to buy a bag of cloth rags at home depot and put one rag in each container after I have watered the plant. Then I placed the rag in a bucket of water and wrap the rag around the main stem of each plant. This acts as a ground cover and will keep any weeds out. It also prevents the soil from drying out at the surface, and it is very easy to see any insect that might be on the white cloth. I remove the rag before the sun goes down to let the ground dry out a bit so as not to cause a ground fungus and put it back in the morning. 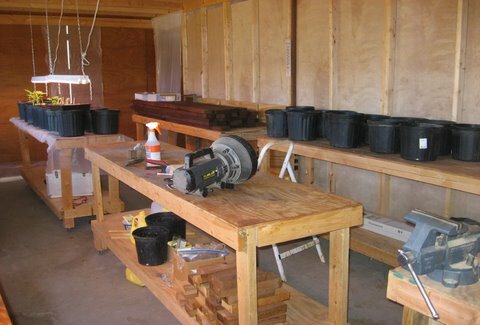 Presently I am growing ten different winter vegetables in my garden room in thirty two 3-gallon plastic containers. The containers are sitting on three 2′ x 8′ foot tables that are on metal wheels so that I can roll the tables out side when the sun is out and the weather is warmer. We live in Georgia in zone 7. We have the vegetables growing under three 4-foot grow lights now but I am in the process of adding 3 more, two per table. We also use a little electric heater that maintains an even temperature of 62 degrees when it is below freezing outside. We planted these vegetables from seeds on Oct 15th. 2011. 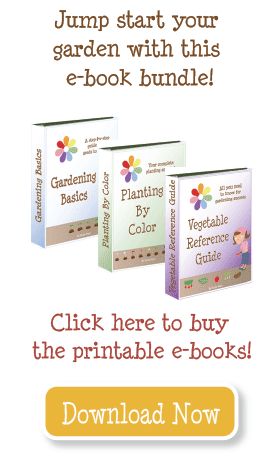 I plan on starting more seeds of the same vegetables every 45 days for a continuous harvest. 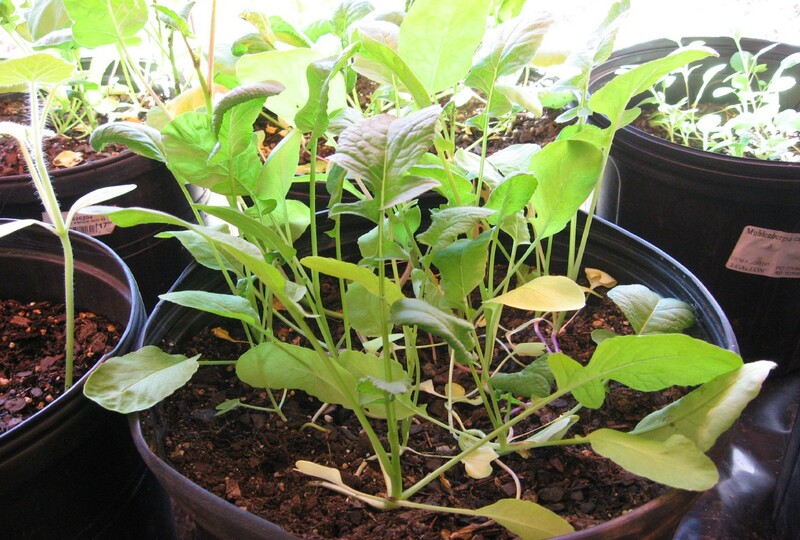 I started the plants in the 3-gallon containers placing about 8 seeds in each container and when they came up we then thin the plants by cutting the less healthier plants with a pair of scissors. This way I don’t have to transplant them into larger containers. 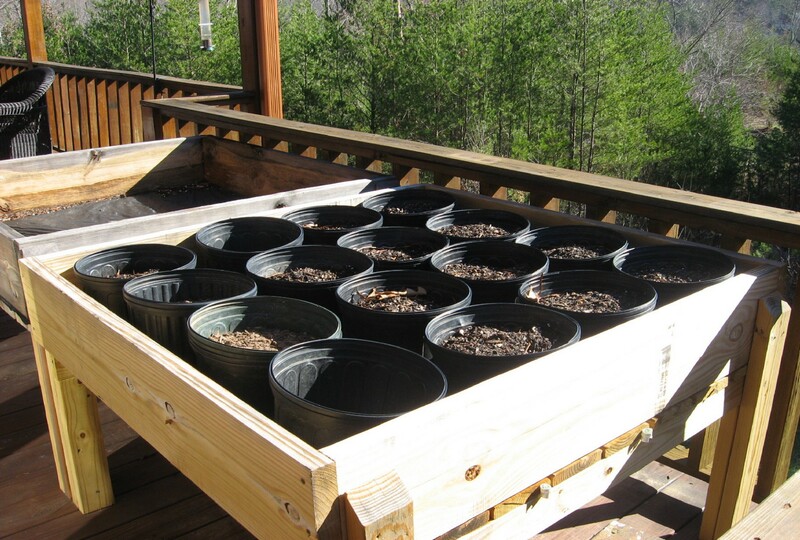 After the last frost I will move 32 of the containers to my back porch to two of the 4’x4′ foot raised tables were the plants will receive full sun all day. If it is two hot I can roll the tables under the covered roof section of the back porch. The other 64 containers will be rolled out on to the concrete slab in front of my garden room which receives full sun also. We will also be planting my spring vegetables like tomatoes, peas, and beans in containers on my back porch where they will be easy for my wife to pick as she needs them. While it is true that tomatoes can not be grown in the winter outdoors you could get an earlier start indoors. We also installed two 55 gallon plastic rain barrels that I have elevated to a height of 42 inches above the ground for a gravity feed for a drip watering system that collects the rain water from the roof via two down spouts. That will be utilized when the vegetables are out doors. What I really would like to do is to get this idea out so that people can learn how to be more self sufficient. Raised gardens are wonderful if you are not elderly like me and another disadvantage is you can not move the ground raised beds from place to place like you can if you grow them in containers. I started with cutting milk jugs in half, popping holes in the bottom and growing raddishes. How do u prepare your containers,how many holes do u use and do u fill your containers with rocks or tiny rocks for drainage?Where did u get your containers from? Do you have any trouble with bugs? What do u do about them?Where do u get your containers?What kind of soil do u use?What kind of fertilizer do u use, and how often do u fertilize. Where do u buy your seeds? Do u use any seed starter ,special solution or special soil to start your seeds.Do u ever grow cucumbers in containers or any other vining plants? What kind of tomatoes and beans and peas do u grow in containers , do you need to use some kind of support? Can u be more specific on when you plant what seeds and how long it takes for them to grow big enough to put them outside. You have an amazing system? You need to video tape your process and post it on U-tube , from start to finish.Where did u buy your grow lights? Hi James, Do you have a website? 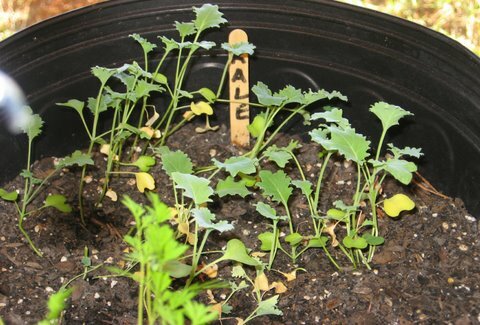 Your container gardening method looks very interesting. I would like to know more. Can you contact me at alangrider@me.com?